RENOVATE + REVAMP with Atomic Ranch Magazine. 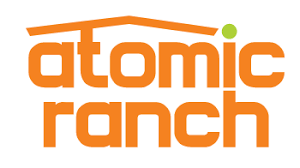 As a lover of Mid-Century Modern design and architecture it's an honor to collaborate with Atomic Ranch. Click the AR logo above to see the featured transformations. While interning for Jonathan Adler, James assisted in styling and recreating the design for Liz Lange’s summer home which was featured in “House Beautiful”'s May 2009 issue. For the photo shoot they brought in furniture and accessories to enhance the existing design that Jonathan had previously created. They added pieces that not only complimented the room and also added visual appeal when featured in the magazine. The Jonathan Adler team embraced staging techniques and added dimension throughout the house so that every room 'popped' with color which was Jonathan Adler's theme for his 2009 designs. The white surround creates a clean palette for the color emphasizing the brightness of everything. James' personal favorite recreation was the master bedroom, where they created a canopy bed using window hardware that was simply mounted to the ceiling. The result: A very dramatic and sophisticated look that screamed 'Joy'!